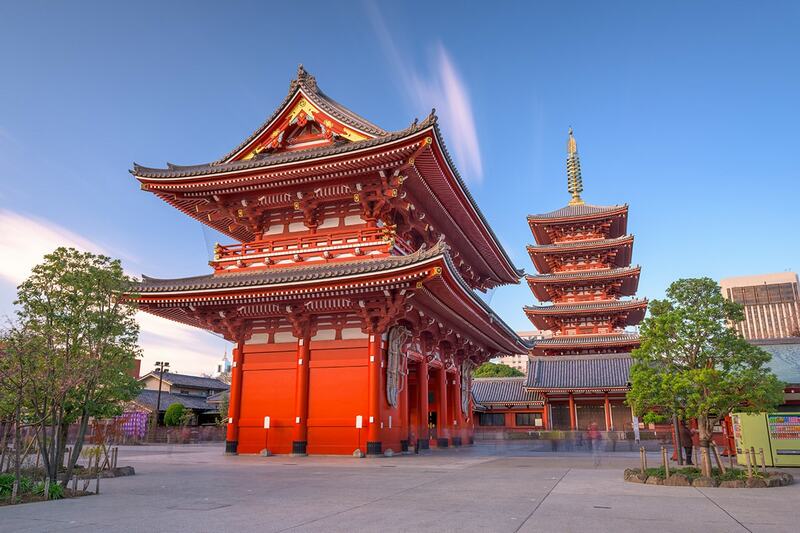 16 day Timeless Japan tour including return international flights, accommodation, breakfast daily, professional tour guides, in-depth sightseeing and more. per person twin share |	Typically $8,440! Spend 16 incredible days touring the land of the rising sun and experience the best that Japan has to offer. 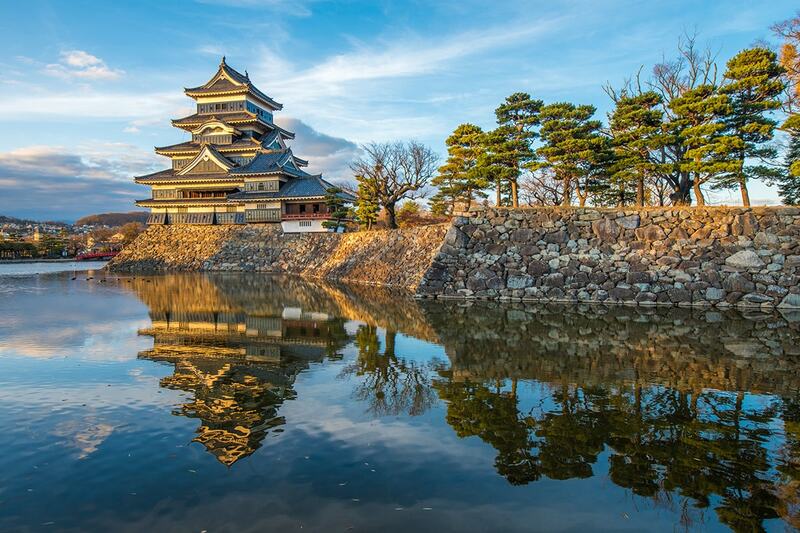 Travel from buzzing Tokyo to Osaka and on your way see brilliant landmarks including Hakone, Matsumoto Castle, Kyoto Imperial Palace and Osaka Castle. Feed the gentle sika deer at Nara Park. Enjoy a spectacular view of Mt Fuji and be mesmerised by the different seasons of Japan. 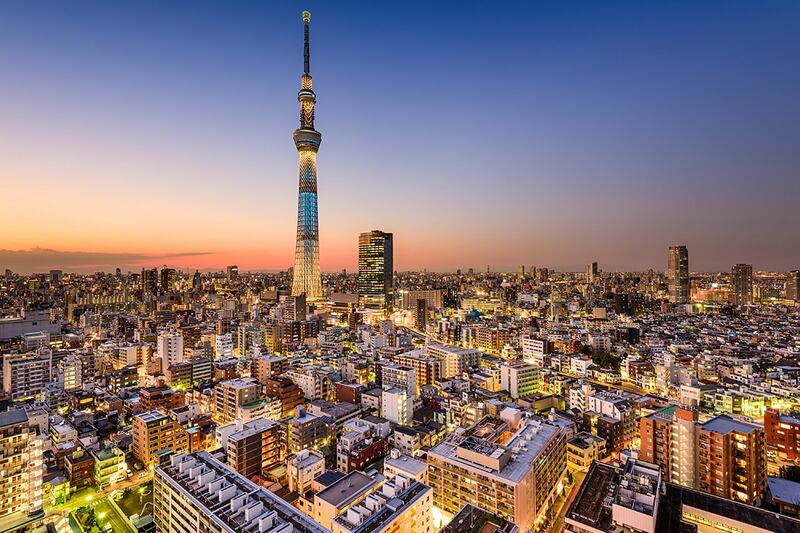 Take an international flight from Australia to Tokyo via a connecting city. Please note: some flights may depart one day later. On arrival in Tokyo, your friendly tour guide will be waiting at the airport to transfer you to your hotel. Today we will take a full-day coach tour of Tokyo, starting with Meiji Shrine. The shrine is located within a 170 acre forest in the centre of Tokyo. 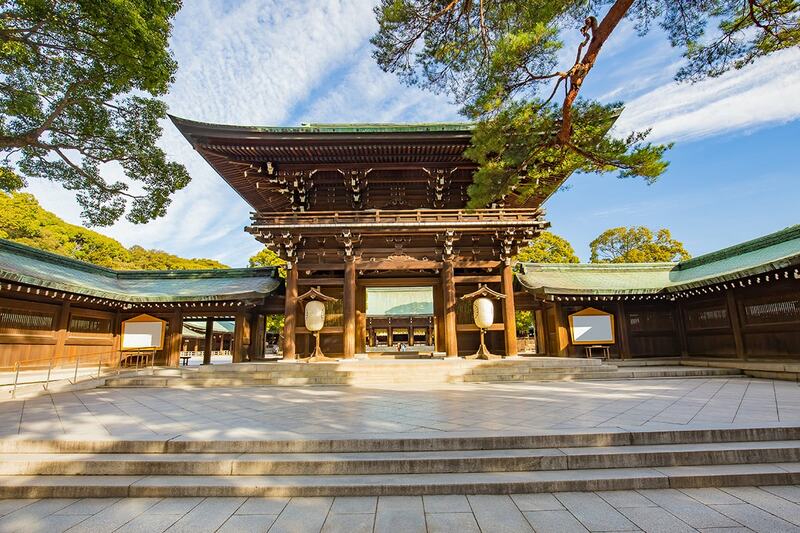 Constructed of cypress wood and copper, the shrine commemorates Emperor Meiji, Japan’s 122nd emperor, who presided over Japan’s industrial revolution and emergence onto the world stage. Next we visit Asakusa district and visit Senso-ji Temple. This is Tokyo’s oldest temple, and is dedicated to Kannon, the Buddhist goddess of mercy. On the approach is Senso-ji is Nakamise Shopping Street, a centuries-old promenade of shops selling traditional snacks and souvenirs like kimonos and bottles of saké. We then visit Tokyo Sky Tree. Opening in May 2012, the Skytree is a television and radio broadcast site, and contains a restaurant and two viewing platforms. At 634m, this is the 2nd-tallest structure in the world! We round off the day with a trip to Odaiba, a large artificial island in Tokyo Bay. 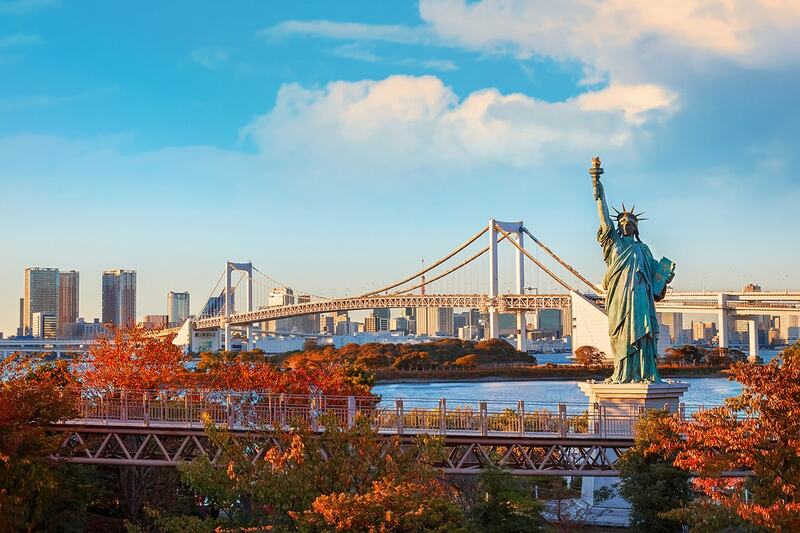 Built as an island fortress in the 19th century, Odaiba will be a venue for the 2020 Olympic Games, and is already a popular leisure and sightseeing area. 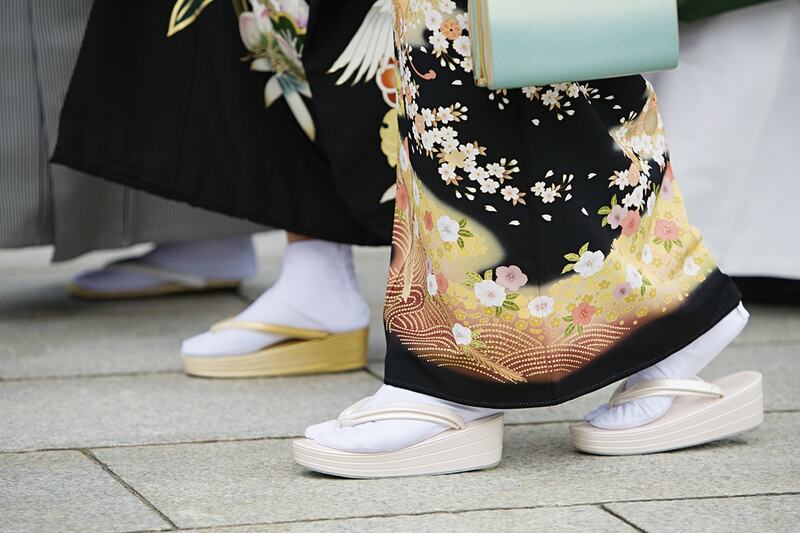 Enjoy a free day of leisure in Tokyo. Optimal Tour (at own expense): Tokyo Day tour. Take we take a tour of Hakone. 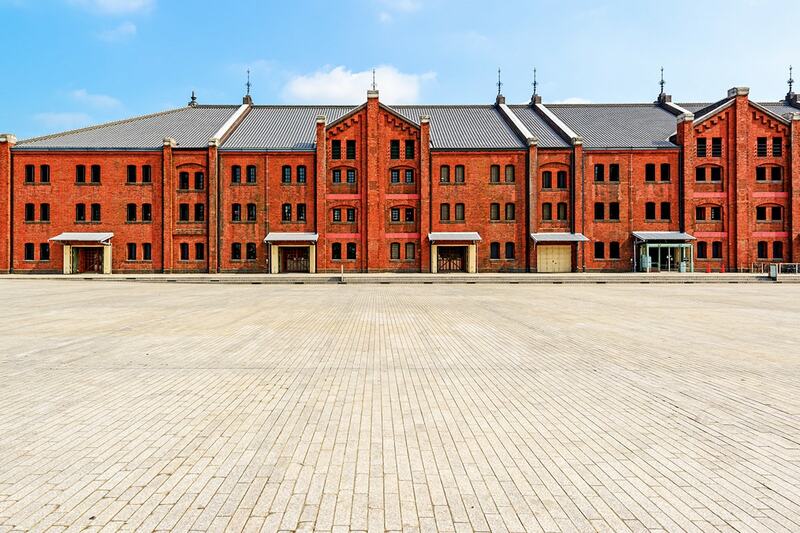 En route, we explore the Yokohama Red Brick Warehouse. These buildings were erected a century ago as customs buildings for Yokohama Port. Requisitioned by the US military after World War 2, in 2002 they were re-purposed as a cultural and shopping complex. Next, we visit the incredible Daibutsu (Great Buddha) at Kotoku-in Temple. Constructed in 1252 and once covered in gold, the bronze Great Buddha is an impressive sight. This is followed by a boat cruise on Lake Ashi. The lake sits within Mount Hakone, and is famed for its views of Mount Fuji. Boats inspired by western warships cruise the scenic lake, and the picturesque forested region has been popular for hikers and sightseers for centuries. Transfer to Kawaguchiko, where you will enjoy dinner before spending spend the night in your traditional hot-spring onsen guesthouse. Today we visit Mount Fuji‘s 5th Station. Here, above the clouds, we will view the sacred mountain’s enormous summit if weather permits. We then transfer to Matsumoto (approx. 2.5 hour drive), where we visit Matsumoto Castle, also known as ‘Crow Castle’ due to its dramatic black exterior. Completed around 1593 and is listed as a National Treasure of Japan. Transfer to Nagano and to your hotel. Travel by coach to Takayama. 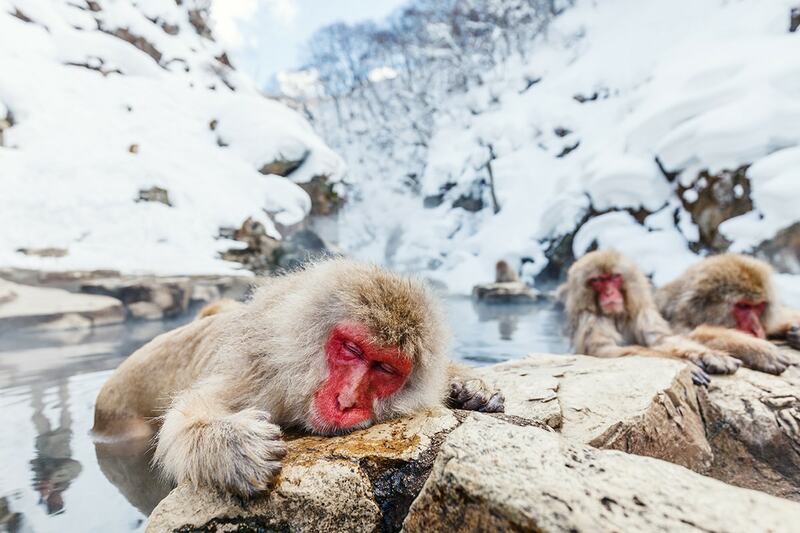 Along the way, we will visit Jigokudani – the famous Monkey Park where, in winter, Japanese Macaques bathe in volcanic hot springs. 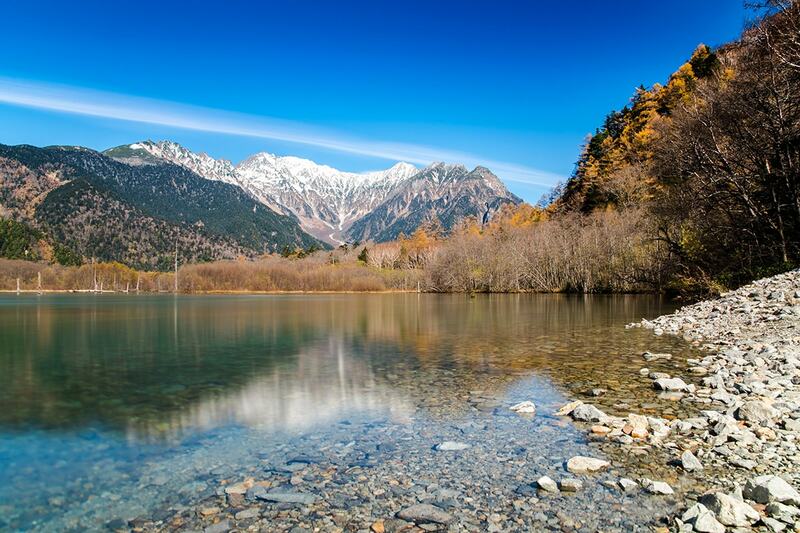 We’ll also visit picturesque Taisho Pond (Taishoike) in Kamikochi. This is a beautiful scenic destination, with Mt. Hotakadake and Mt. Yakedake visible in the distance, and the scenery around the lake changes dramatically with the passing seasons. 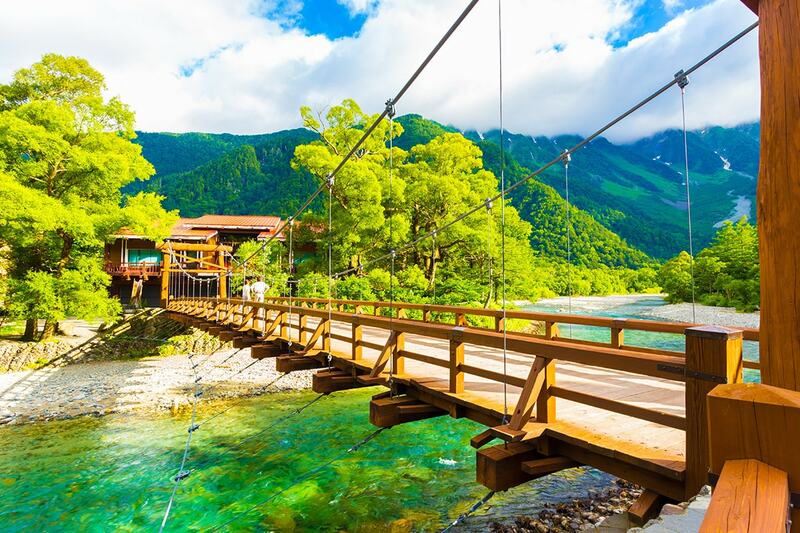 Next, visit Kappa Bashi (Kappa Bridge) – where you’ll find a suspension bridge over the river, affording spectacular views of the surrounding mountains. Transfer to Takayama. Today we travel to Shirakawago Village, a World Heritage site where 114 Gassho-style houses with steeplypitched roofs in the shape of a triangle. Built many hundreds of years ago, these historic houses stand together in a beautiful natural setting. On the way, we stop at Takayama’s Old Town, a wonderfully well-preserved slice of old Japan, with houses and shops dating back to the Edo period (1600-1868). As well as the charming architecture, there are unique cafes and a number of old saké breweries. 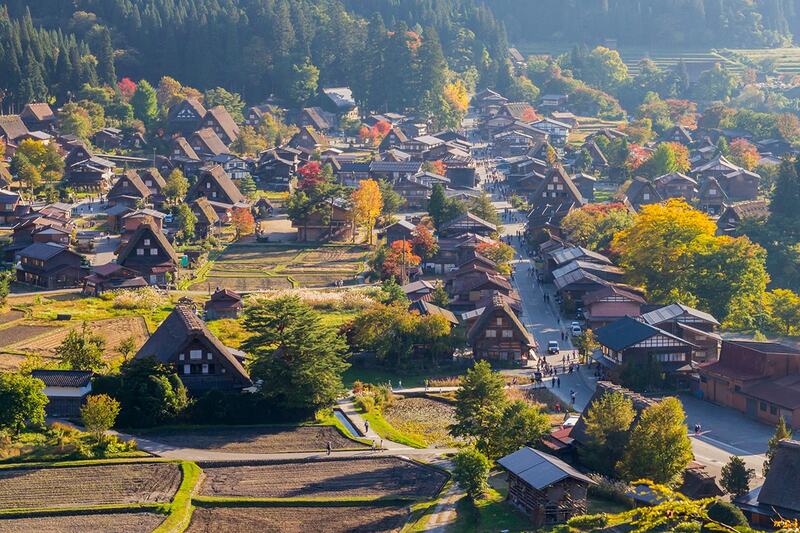 Enjoy some free time to explore the sights, and then it’s on to Shirakawago, where from the site’s observation deck you can enjoy a spectacular panoramic view of this UNESCOlisted village of thatched-roof houses among the gorgeous mountainous scenery. Transfer to Kanazawa to rest for the evening. 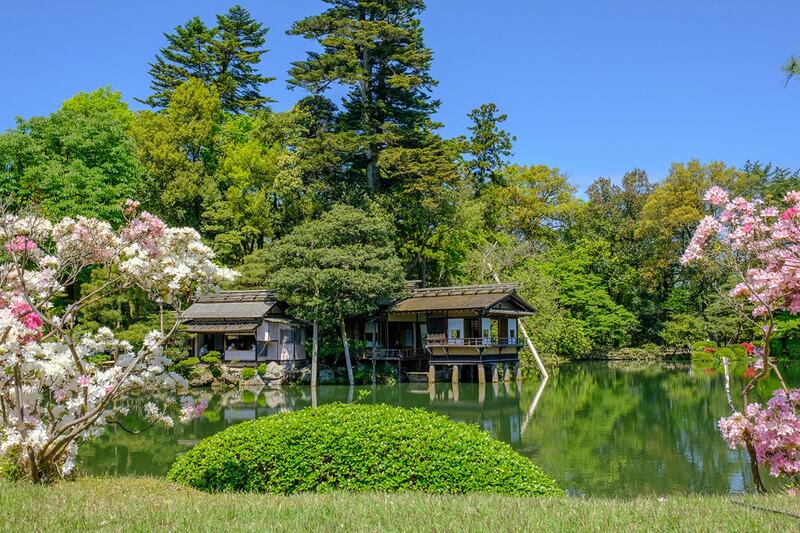 In Kanazawa, visit Kenrokuen Garden – one of Japan’s top three landscape gardens. Developed over more than 200 years, starting in 1620, the garden contains almost 9000 trees and 200 plant species. We also visit Nomura House, the historic residence of the Nomura Samurai clan. The house and grounds provide an insight into the lifestyle of the Samurai class during the 16th-19th centuries, and feature beautiful architecture, gardens, and décor such as painted screen doors. We then make our way onto Kyoto. 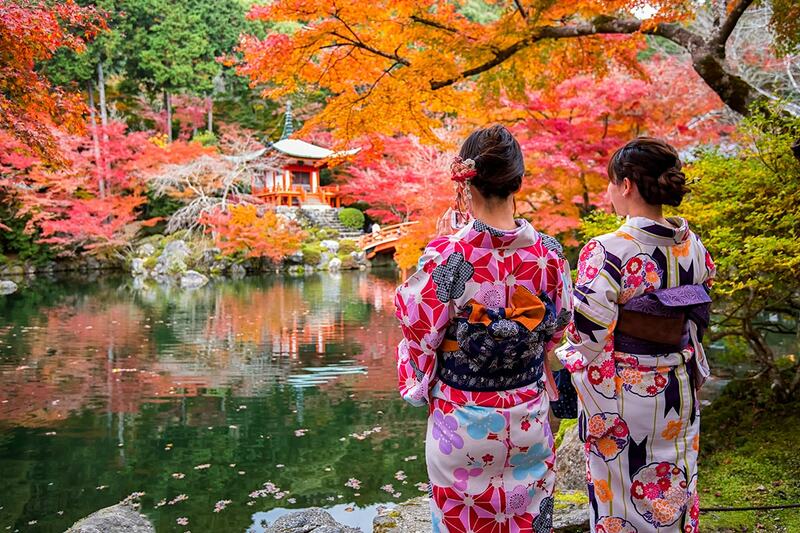 Enjoy a free day of leisure in Kyoto. This morning, we travel the short distance to Nara, and visit Kinkakuji: Golden Pavilion. 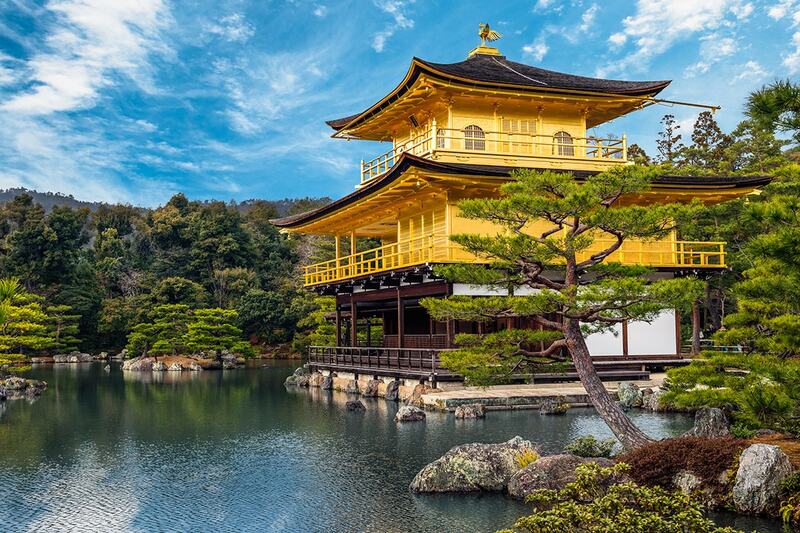 This is a Zen temple and World Heritage site with two floors covered entirely in thin layers of pure gold, set within a beautiful classical Zen garden. The detailed architecture incorporates three distinct architectural styles – Shinden, Samurai, and Zen. Next, we visit Heian Jingu (Heian Shinto Shrine), a replica of an ancient imperial palace, and a symbol of the rebirth of Kyoto after World War 2 – the enormous vermillion orange tori gate is unforgettable! Next, we visit Todaiji (Great Eastern Temple), with its Great Buddha Hall – the world’s largest wooden building. This impressive building houses a huge 15m tall bronze statue of the Buddha Vairocana. We then wander through Nara Park, where over 1,200 tame sika deer roam freely. Return to Kyoto by coach. 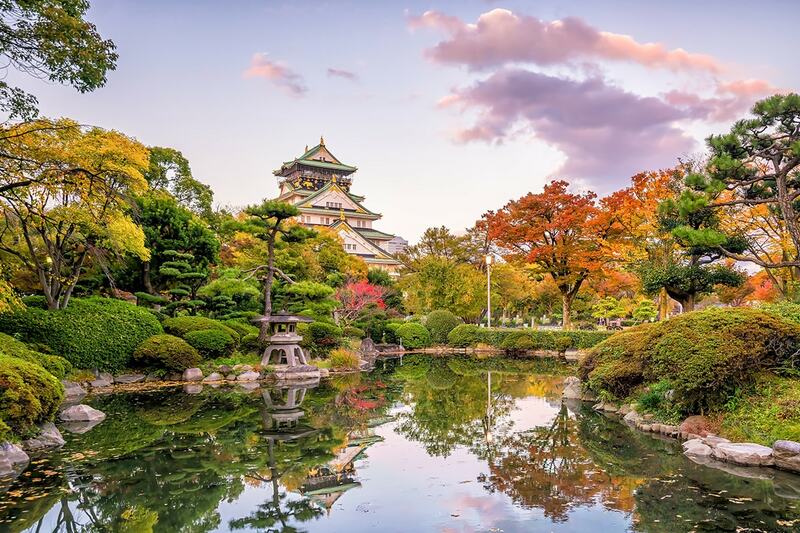 This morning we travel by coach to Osaka to visit Osaka Castle, which played a major role in the unification of Japan during the Azuchi-Momoyama period in the sixteenth century. The castle is elaborately fortified, and decorated in an attractive white and green colour scheme. After exploring the extensive castle and grounds, we move on to something more modern – the Umeda Sky Building Floating Observatory, which provides an unparalleled elevated view of Osaka. The viewing platform is suspended between two 40-story towers, at 173 metres above the city streets. The Namba-Shimsaibashi area in the city’s South encompasses the city’s premier shopping districts, full of boutiques, designers outlets, restaurants and bars. We end the day with dinner at an Izakaya. These are Japanese-style bars which serve a variety of side dishes along with saké and beer – their grilled meat skewers are particularly good! Today we take a half-day tour by coach to Himeji Castle, which is the largest surviving example of a traditional Japanese castle. Comprising 83 buildings, the white roof of this UNESCO-registered complex is said to evoke the wings of a heron taking flight – hence the popular name ‘Shirasagi-jō’ – White Heron Castle. In 1945 an American firebomb was dropped into the top floor of the keep, but didn’t ignite, and the castle was renovated in 1956. 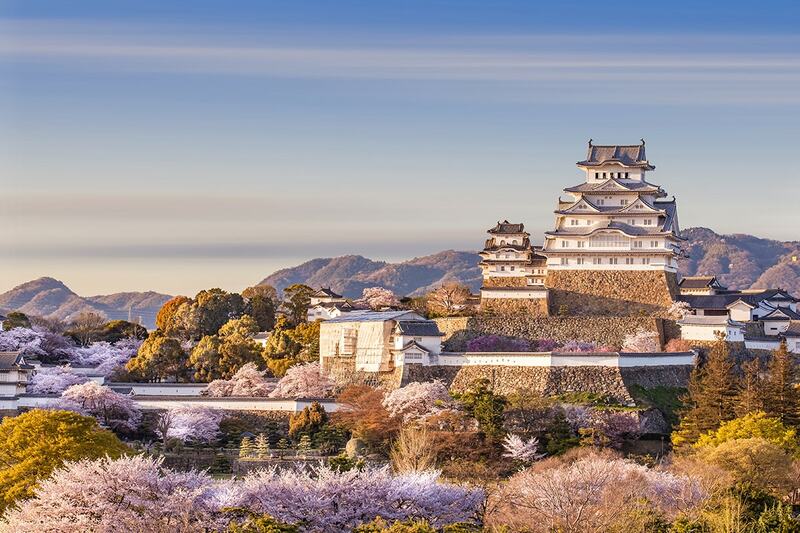 Himeji Castle is the most visited in Japan, and the site offers some wonderful views of surrounding Himeji city. Arrive back at the hotel around lunchtime, and enjoy the afternoon free at leisure. Enjoy a free of leisure in Osaka. Optimal Tour (at own expense): Osaka Day tour. After breakfast transfer to Osaka airport for your flight home via a connecting city. Cherry Blossom travel dates available! 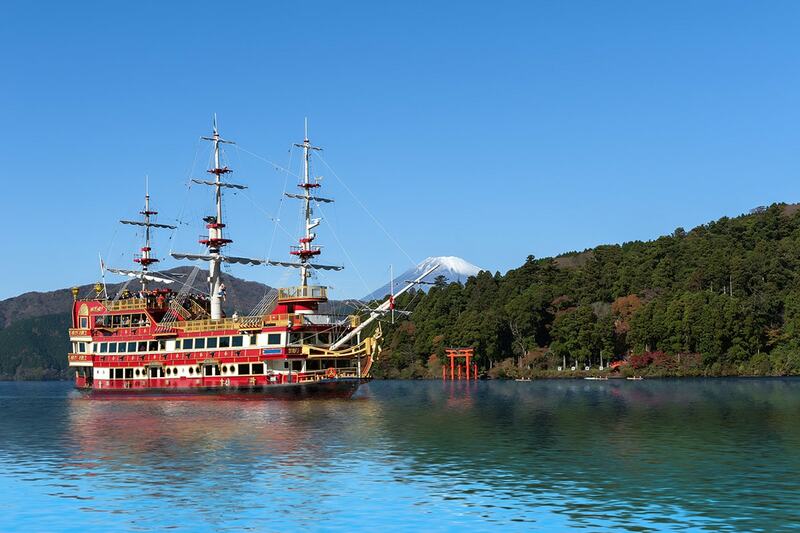 Cruise on Lake Ashi, famed for its views of Mount Fuji. A deposit of $1,069/$1,369/$1,669 per person are due at the time of purchase in order to secure your date. Please note that hotel rooms in Japan are smaller in sizes compare to other countries. Payable direct to Nexus Holidays upon confirming your booking. Brisbane & Adelaide – A $300 per person interstate surcharge applies. Perth – $600 per person interstate surcharge applies. Arriving early/Extending your trip: From $250 per person (subject to availability and applicable fare difference). If you wish to alter or extend your trip, please purchase your voucher first and submit a request on your booking form. We will then provide quotations for any alternations or extensions. Should you wish to proceed any additional charges will be collected. Please note, if you have selected a breakaway, airport transfers (if applicable) will not be provided.